There are some people who wear hats and wear them well. Everyone else just needs to try harder. If you are a person who can rock a floppy hat, go for it. The rest of us can stick with a knitted beanie, which is still plenty cool, thank you very much. And in the summer, a bucket hat provides a needed bit of shade. For some hipster swag, go with an pom pom beanie. 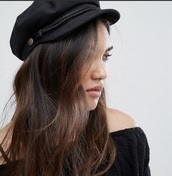 A German-style felt hat can be quirky and cool, and an elegant '20s-style felt beanie acts as a unique hair accessory. Sure, hats keep your head warm, but they are also fun.